My children attend a school in our neighborhood. The school, Melrose Leadership Academy, belongs to Oakland Unified School District. Parents and educators have created a supportive community. So far, so good. Nice simple story. Melrose Leadership Academy is moving to a new site this summer. With less than two weeks before school begins, the multipurpose room is full with supplies from two different schools sites waiting for movers. Except that everything is a little more complicated. MLA has been continually growing and moving. This summer, we have moved to Maxwell Park School after outgrowing our old site at Elizabeth Sherman. Both Elizabeth Sherman and Maxwell Park Elementary have closed in the last ten years, but both buildings are still called by their former names. (I think… it’s complicated.) Melrose Leadership Academy is a K-8 school without 4th and 5th grades. The lower grades are dual Spanish immersion and the higher grades are middle school. When the Spanish immersion program began, we started with kindergarten. On Saturday, many of our community met for a school work day. Teachers unloaded boxes and set up their rooms again. We do not have a librarian, but we have a full library. 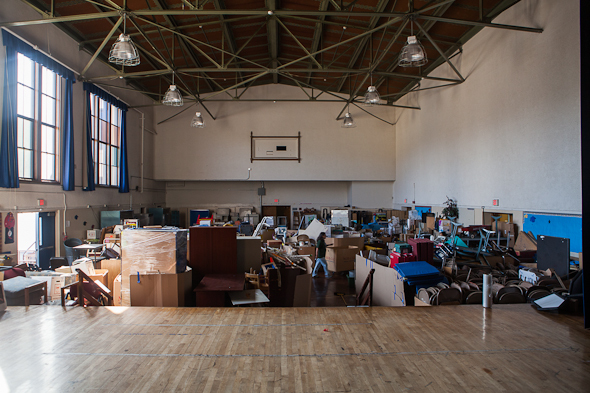 With less than two weeks before the first lunch, our multipurpose room is full of supplies waiting to be moved away. Our old multipurpose room had a maximum occupancy of 146. The new school’s listed maximum is more than three times as large. How will it be ready for the first lunch or Thursday’s registration? Coincidentally, professional skate boarders from Zoo York visited our school the same day as parent work day. It seemed appropriate. I do not know how we will be ready for the first day, but we will. We might be a little off balance, and we might fall, but eventually we will soar… with style. This entry was posted on Tuesday, August 14th, 2012 at 3:57 pm. It is filed under Melrose Leadership Academy and tagged with Melrose Leadership Academy. You can follow any responses to this entry through the RSS 2.0 feed.